On its travels around the globe for its Resort and Pre-Fall Métiers d’Art collections, Chanel has presented shows in Texas, Cuba, Salzburg and Dubai – but never in Karl Lagerfeld’s hometown of Hamburg. That all changed last night when the Parisian house staged its Pre-Fall 2018 collection there as a homecoming for the German designer. Here’s what went down at the show. 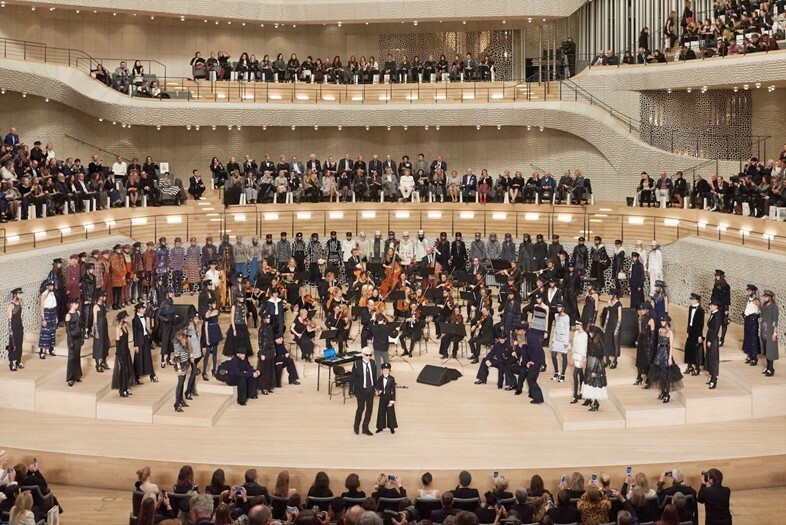 Taking place in the Great Concert Hall of the Elbphilharmonie – a newly built structure in the city – guests took their seats in the multi-tiered space. The models walked around the entire venue before gathering in the pit next to the orchestra who provided the live soundtrack. No need to worry if you were up in the eaves, Chanel kindly provided opera glasses to see the action from wherever you were seated. Inspired by the port location of the show, the collection was heavily nautical themed. Think navy cable knits, sailor-back Chanel jackets and a reimagined tweed version of a seaman’s uniform. There was also a 60s vibe that came through via matching tweed two-pieces with barely-there miniskirts, Baker boy hats and the mismatched patchwork-esque fabrics. It goes without saying, but Chanel is known for its bags. For the latest collection, this manifested itself in the form of quilted bags that looked like accordions, sailor bags (printed with the famous “CC” obviously) and the pièce de résistance – boxy clutches that looked like miniature shipping containers. Only one question: how much would it cost to ship us one? Chanel is no stranger to men on its runway, with Lagerfeld’s godson Hudson Kroenig often making appearances alongside his father Brad. This season though, the young Kroenig led a procession of six sailor-inspired menswear looks in a row at the beginning of the show. 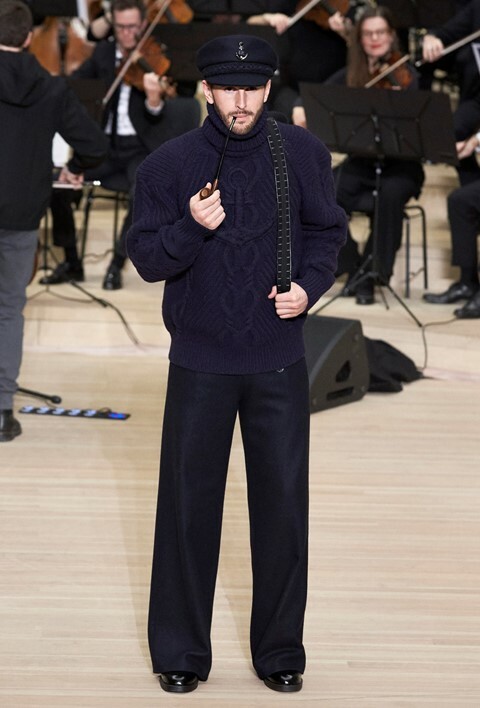 Wearing oversized navy knitwear and seaworthy hats, the men took to the runway smoking pipes too. Except for Hudson of course – he’s only nine.